Our product range includes a wide range of portable bunkhouse and galvanized bunk house. Roof Frame: Roof frame made of 75mm C-Channel with 50mm x 50mm x 16g Sq.pipe grid. GI.18g sheet welded on top of the frame to form two-sided slope roof. Exterior Walls: 1.2mm GI specially corrugated sheet welded on roof and Flooring frame. Wall-coated with two coats of red oxide from both sides and two coats of synthetic enamel paint from outside. Colour of your choice. Interior Walls: Interior walls insulated with glass wool, 50mm thick. Inside paneling of 9mm particle board, Laminate finish, Colour of your choice. Powder coated aluminum section used on all joints of panels. 40mm wooden molding used as skirting of the wall and also to hold carpet. Interior Roof: Interior roof insulated with glass wool of 50mm thickness. Inside roof paneling of 9mm particle board, Laminate finish white color. Powder coated aluminum section used on all joints of panels. 40mm wooden molding fixed on corner joints of wall paneling and roof paneling. Partition Walls: All partition walls Frame made out of 50mm x 50mm x 16g sq.pipes 9mm paneling of particle board on both sides of the wall, with concealed wiring and concealed switch socket board. 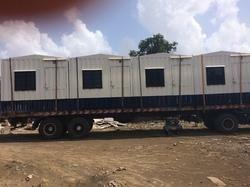 We are offering Galvanized Bunk House to our clients.